In light of North Korea’s accelerated nuclear weapons testing and Donald Trump’s rhetoric over the past year, from his threats to rain down “Fire and Fury” to his childish claim that his “nuclear button” is bigger than Kim’s Jong-un’s, the Bulletin of the Atomic Scientist moved the Doomsday Clock forward to 2 ½ minutes to midnight, the closest it has ever been. But now a sudden unexpected twist. Trump has agreed to meet Kim. Many have welcomed the talks, expressing hope for progress on disarmament and even an end to the 60 year state of war between North and South Korea. Of course dialogue is key to resolving conflicts. And demilitarization of the Korean peninsula is desirable. Trump sees himself as the great deal maker and may see this as his big chance to demonstrate that prowess on the world stage after a year of near nil legislative accomplishment and recent weeks of White House chaos. Flattering Trump, South Korea’s national security adviser, Chung Eui-yong told Trump “that his maximum-pressure policy brought us to this juncture” and that Mr Kim is “committed to denuclearisation”. But Trump’s rash action appears to completely lack planning and preparation. The day before Trump accepted Kim’s invitation Rex Tillerson stated that the U.S. is “a long ways from negotiations” with North Korea. It seems Trump did not consult his Secretary of State before agreeing to North Korea’s longstanding main objective, to gain the status of a meeting between its head of state and a US President. Upon taking office Tillerson dismissed numerous officials at State and has not replaced them. The US does not have in place high-level diplomats to run parallel talks, or mid level officials to assist the president. How can the US pull together a coordinated negotiating strategy when it does not even have in place an ambassador to South Korea or an Under Secretary of State for Arms Control and International Security? 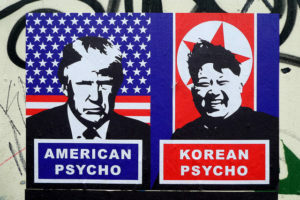 We hope Trump’s meeting with Kim Jong-un succeeds, though it would set a bad precedent, demonstrating that apparent irrationality and threats to use nuclear weapons can lead to negotiations and peace. The safer course would be for Trump to use the opportunity to invite North Korea, Russia, and China, to join it in signing the Nuclear Weapons Ban Treaty, then direct Tillerson to fill that Under Secretary of State post and get to work on the detailed work of disarming the arsenals of weapons that continue to threaten us all with armageddon.